Clear as glass that Gmail does not backup data by itself. How SysTools Gmail Data Backup Tool is Beneficial? Follow the below steps to perform Gmail deleted emails recovery process and get back deleted emails easily. First thing you must do is Go to Trash Folder (Recycle Bin for Gmail) inorder to recover deleted messages from Gmail. Suppose you have tons of messages in your Trash that you have not cleared from a very long time. Gmail provides you with an In-built search feature to find your mails.. Select Trash Folder. And type the keyword that is present in your email and you can easily search the deleted message from Gmail Trash Folder. Step 3. Move Emails from Trash to Inbox Folder. After getting deleted Gmail messages in Trash. You can either Right Click on the message and select Move to Inbox folder. Alternate Solution is Open your mail present in Trash and remove the Trash Tag by Clicking on the Remove Tag (X) option. This will Automatically Move deleted emails from Gmail Trash to Inbox Folder. Step 4: Move Multiple Emails from Trash to Gmail Inbox. If you want to move multiple emails from Trash in Gmail, then select all the files. Afterthat, click on "Folder" icon and select "Inbox" to move all the deleted Gmail emails to Inbox. This case arises when you have chose to permanently delete the data from Trash as well by hitting Delete Forever Option. 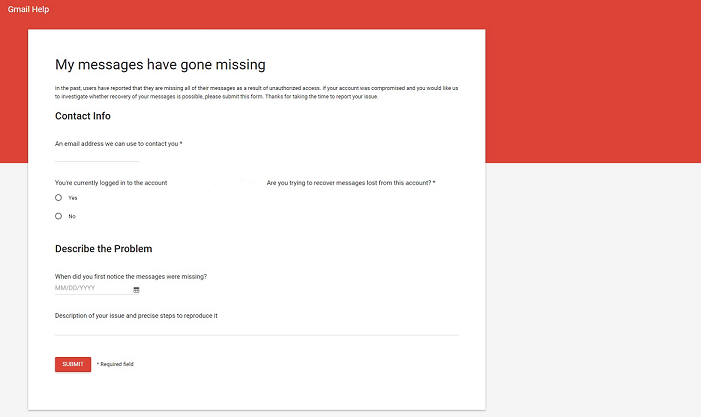 To recover permanently deleted Gmail messages you need to contact the Google Support Team in order to retrieve deleted messages. You need to visit the missing email web page of google as shown below and fill the form with all the detailed description describing your problem in the form. Suppose you have tons of messages in your Trash that you have not cleared from a very long time. Gmail provides you with an In-built search feature to find your mails. Select Trash Folder. And type the keyword that is present in your email and you can easily search the deleted message from Gmail Trash Folder. There are possibilities that user cannot see the Trash Folder in Gmail. This happens because Trash Folder gets hidden due to certain reasons. You can redo the changes and view Trash Folder by changing some Settings to retrieve lost Gmail emails. Select the Setting Tab on the top right corner of the Gmail Window. And choose the Label Tab. This will help you to make Trash Folder visible on the left side of the screen. It allow you to successfully recover deleted messages from Gmail.